Material: Stainless Steel & Silicone,Metal/Latex allergy friendly, Very comfortable to wear, waterproof and Low-allergy. 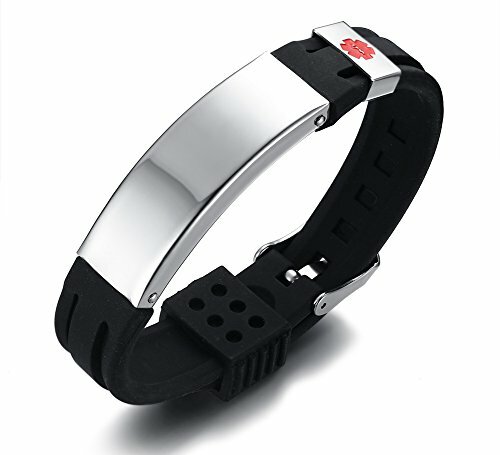 Adjustable,Perfect medical alert bracelets for outdoor sports for men or boy. Classic fashion yet Practical.Submit your In Case of Emergency medical information on the bracelets. MEASUREMENT: 15mm width, Length adjustable, Comfort fit/ FREE MEDICAL ALERT IDENTIFICATION WALLET CARD. IMPORTANT:We offer free engraving for this product. Please click" customize now" fill in your engrave information then "add to cart". We will get your engrave information from your order. If you don't need any engraving please type" NONE". Any questions please contact us. PEOPLE WITH THE FOLLOWING CONDITIONS SHOULD WEAR A MEDICAL ID JEWELRY: Diabetes type1, Diabetes type2,epilepsy,autism,allergies,coumadin,waffarin,heart diease,Blood Thinner,pacemaker,asthma,COPD,stroke,cancer,multiple sclerosis,dialysis lung disease,ADD/ADHD,Alzheimer's,high blood pressure,hypotension, children with special needs etc. PACKING AND AFTER-SALES: It comes with a grey velvet bag that printed with" Mealguet". Perfect for gift. Please contact us directly if any quality problems or shipping problems. We are here to resolve any problem for you. If you are pleased with the product please share your review in product page.